Mortgage markets improved last week in a week of few economic releases. The one major data point — Retail Sales — showed stronger-than-expected, but markets reacted mildly. The report’s strength was whispered in advance of the actual release; its reading validated Wall Street’s growing faith in the U.S. economy. In response to these events, Wall Street continued its flight-to-quality. Mortgage-backed bonds are now at their best levels since early-February. Mortgage rates have improved 4 straight weeks. Unfortunately for rate shoppers in Utah , the gains have been meager. Conforming mortgage rates have only dropped slightly. This week, however, the market could move in either direction. The biggest news on tap is the Federal Open Market Committee’s 1-day meeting, scheduled for Tuesday. The Fed is expected to leave the Fed Funds Rate near 0.000 percent, but that doesn’t mean that mortgage rates won’t change. The FOMC’s post-meeting press release will be closely scrutinized on Wall Street. 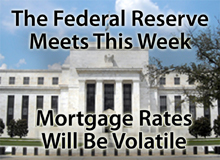 Any changes in theme, tone, or message will cause mortgage rates to dart. This week also marks the return of housing data with Housing Starts, Building Permits, and Homebuilder Confidence due for release. Housing is believed to be key to the economic recovery so strength in these reports should lead mortgage rates higher. In addition, several inflation-related data sets will be released including Consumer Price Index and Producer Price Index. Inflation is generally bad for mortgage rates and with gas prices rising to a multi-year high, pressure will be on for mortgage rates to rise. The nation’s earthquake, tsunami, and (now) looming nuclear threat will have implications on the global bond market. Mortgage rates may benefit while the crisis remains unresolved. If you’ve floated a mortgage rate over the past few weeks, it may be time to lock that rate down. Economic factors should be pushing rates higher, but geopolitics and natural disasters are keeping them low. It’s a perfect time to commit to a loan. This entry was posted on March 14, 2011 at 5:48 am and is filed under Weekly Review. You can follow any responses to this entry through the RSS 2.0 feed. You can leave a response, or trackback from your own site.